Oscar, in Florida woke up at 5am yesterday and went down to the Apple store to pick up the all-new Apple iPhone 3Gs which has a 3 Megapixel camera with a new macro touch screen function. The way it works, is that the new iPhone camera has an auto-focus camera, but if you touch an item on the screen if auto-focuses on just that item. 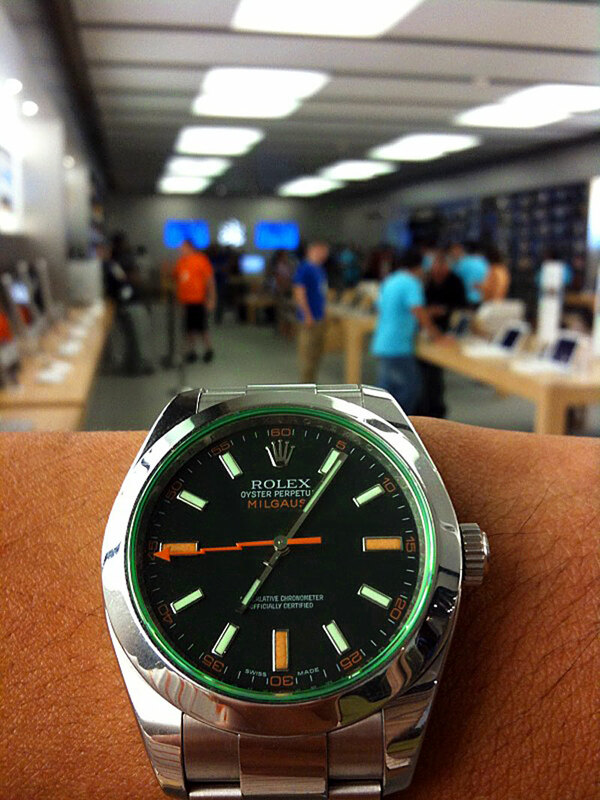 So in this photo Oscar, touched his Rolex Milgauss GV and which put it in focus. For me personally, the significantly improved camera on the iPhone is the main reason I will be upgrading. I can't even begin to tell you how many stunning shots I missed, because of the lame camera on the earlier iPhone. The whole point of having a camera in your iPhone is so you don't have to carry around a separate point and shoot!!! At 3Megapixels, with built in auto-focus and macro point-and-focus, the new iPhone 3G S is a dream come true!!! Also, I have seen video that was shot with the iPhone and it looks really good!! !